Finally a pair of gloves that will actually protect your hands and arms! Prune roses with ease and without fear of being punctured. Great for people with sensitive skin and those looking for serious protection. Parva Garden offers you a superior pair of rose gardening gloves. Our customers love the rich yellow color that wears nicely with age. Our high quality gloves go beyond just pruning roses, many have found our gloves to protect against roseberry bushes, holly, hawthurn trees, silverthurn, succulent and thorny vines too! 100% Satisfaction Guarantee. 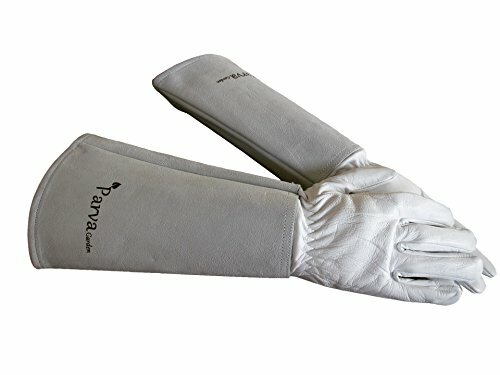 We at Parva Garden believe you should love your gloves and if you are not satisfied with your purchase we will gladly offer you a full refund. Thorn and Puncture Resistant - Save your skin from scratches while performing garden or yard work. Heavy Duty Gloves - Made with kevlar thread stitching and double-reinforced padded palms. Flexible and Supple - Thanks to its natural lanolin content found in our top goat grain leather. Extra Long Cuffs - Durable canvas stays up on its own and wide enough to wear with heavy garments. Makes a Great Gift for Every Gardener. For men and women sizing please refer to sizing chart. If you have any questions about this product by Parva Garden, contact us by completing and submitting the form below. If you are looking for a specif part number, please include it with your message.